As a fun personal project, I upcycled our old IKEA table using my new acrylic pouring method, and finished it with three coats of resin. The top coat of resin contains glitter, and it really looks like brightly colored polished stone. 1. Paint: I prefer Golden Fluid Acrylics but craft acrylic paint can work if you mix and strain it. 2. Pouring Media: I use Flood brand Floetrol, a hardware store paint extender. I mix my paint about 1:8 with Floetrol and sometimes water it down a little bit if the paint is thick. I also add silicone spray just before pouring to create more cells. 3. Containers: You can use disposable cups and sticks to mix your colors, but for a big project like a table, I recommend using condiment squeeze bottles with a marble inside each one, to mix and dispense your individual colors easily without waste. I got mine on Amazon but you can find them in cooking supply stores also. 4. Safety and Cleanup: Gloves, masking tape, sanding sponge, big apron or coveralls, something to protect the floor and absorb drips. You’re going to make a huge mess! 5. Food safe resin. You’ll need something to spread the resin, and a torch or heat gun to pop the bubbles and smooth it. I did three coats on this table. You really want gloves for handling resin, and isopropyl alcohol for clean up. Don’t be like me and get resin in your hair. 6. Extras: I find that a Dremel tool is handy for sanding the resin drips after they dry. 7. Tips: If you have a choice of tables, I recommend not starting with one that has a removable leaf, like I did. The end results were beautiful, but it made my first project a lot more complicated since the resin kept sticking it together. 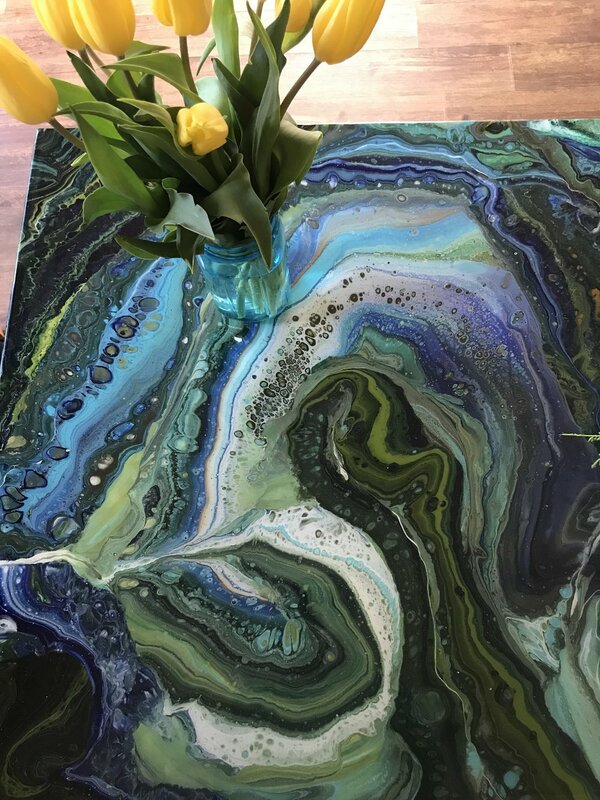 Plan to not use your table or have children or pets near it for a full week - the paint takes at least two days to dry, and each coat of resin takes a day, then it needs to cure. The results are worth it though, and the tabletop is strong and shiny like glass.